Six varieties of banana and various chips bought in Leicester: there are more types of banana than the Cavendish variety that is universal in Western shops! Pat Heslop-Harrison was interviewed for BBC Radio 4 “The Food Programme”. I have posted some of the points I wanted to make on AoBBlog.com, and a link to the whole interesting programme including my interview is here after broadcast of the longer version of the programme. 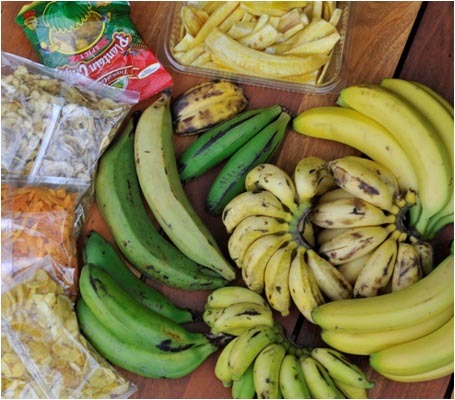 This entry was posted in Farming, News, Press and tagged banana, biodiversity, crops, disease, diversity, fusarium, genetics, musa, tropical race 4. Bookmark the permalink.